Perfect next to any Early American inspired bed, these beautiful Wrap Around Nightstands offer a quaint Colonial style that will set the mood for your entire bedroom suite. 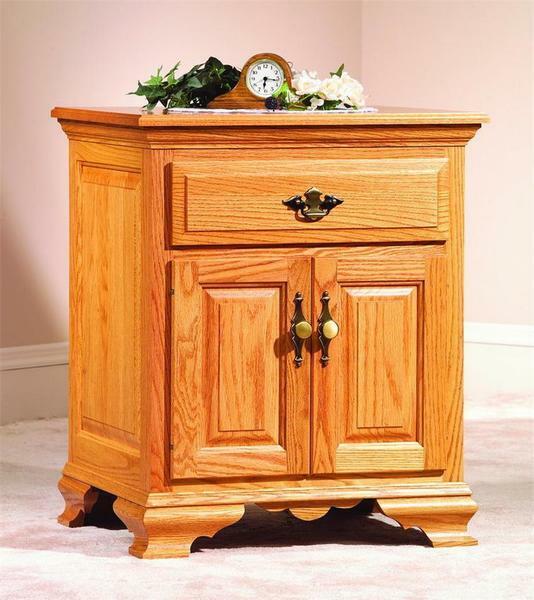 Crafted from solid hardwood, with unique raised panel sides and door fronts, surrounded by a large beveled edge drawer and curved feet, this nightstand has all the antique feeling you'd want, with the luxuries of modern piece of furniture. The beveled edge top offers plenty of space for your storing you lamp, alarm clock, or any other bedside necessities, for easy access. 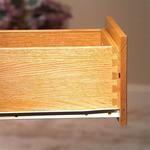 Below the beautiful molding lies a large drawer, opening to reveal a dovetailed box that is conveniently mounted with two full-extension slides, stretching completely away from the frame to give you access to all of the items inside. Below, the two raised panel doors open to reveal a huge storage space that can house your favorite books and other nighttime necessities for easy access, ensuring you never have to search for anything you need before you doze off for a beautiful night of sleep. Customize the piece by choosing your favorite hardwood, stain color, and a complementary hardware, and your new nightstands will be made just for you. If for some reason this nightstand is missing something, or the dimensions aren't perfect for you space, just let us know. 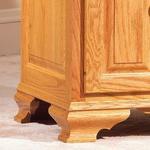 Our furniture specialists are available to assist you with a custom piece of furniture that is perfect for you! Give us a call today for a free custom quote, or to request stain samples and start your order by phone. Toll-Free (866) 272-6773.